Avakai dolls, currently in the Kickstarter phase, are possibly the coolest and craziest combo of old craftsmanship and new technology we've ever seen. As for the old part: the dolls will be made in a small town in Poland and crafted from sustainably forested wood. The dolls are screen-free and, at first glance, might seem like some minimalist play companions with lovely grained wood. A closer look, however, reveals high-tech features including proximity sensing, "speaking" in music notes, even the ability to send a virtual hug. These dolls can actually communicate with each other (see a video of the toys in action) or with a mobile device, making them the cutest, most original version of walkie-talkies we've come across. A free app allows you to choose who the Avakai doll is connected to. Read on-there's more... lots more! 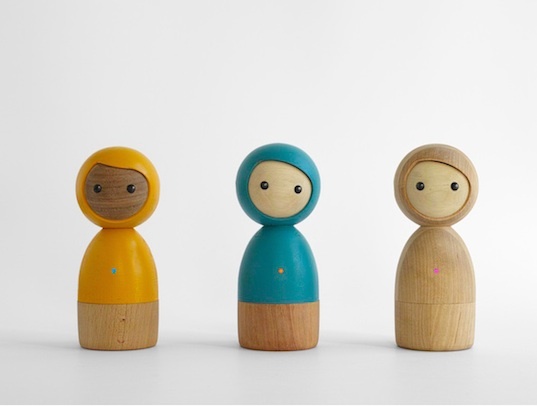 German design team Vai Kai spent over a year interacting with kids and families about the types of smart toys they would want to play with, and Avakai dolls are the super creative result (although you’ll have to wait another year before you actually get a doll… and that’s IF the Kickstarter campaign gets funded). If you want to go tech-free you could, of course, turn off the Bluetooth or smart phone-enabled features, but they’re pretty cool and not so tech-y that we feel like the dolls are just another media-driven gadget. Kids can change the color of the doll’s belly (and therefore reflect a mood) by stroking the doll’s head, taps on the head result in musical messages that can be sent in between the dolls, and wrapping two hands around the doll like a hug will send a hug almost immediately to another connected doll or to a selected mobile device. Our favorite feature is the dolls’ proximity sensing ability: when two Avakai dolls get close to each other, the belly light begins to pulse and gently vibrate. Kids can use this feature to play a variety of hide and seek-type games, or (since the dolls can be opened up and have a small cavity) they can be used for a treasure hunt at a birthday party or as a rainy day activity. The toy’s open source code for programming means that the dolls can be updated with new features, extending the life of the toy. We know there’s a lot to learn about these incredible tech dolls so head on over to Avakai’s Kickstarter page and prepare to think about dolls in a whole new light. German design team Vai Kai spent over a year interacting with kids and families about the types of smart toys they would want to play with, and Avakai dolls are the super creative result (although you'll have to wait another year before you actually get a doll... and that's IF the Kickstarter campaign gets funded). If you want to go tech-free you could, of course, turn off the Bluetooth or smart phone-enabled features, but they're pretty cool and not so tech-y that we feel like the dolls are just another media-driven gadget. Kids can change the color of the doll's belly (and therefore reflect a mood) by stroking the doll's head, taps on the head result in musical messages that can be sent in between the dolls, and wrapping two hands around the doll like a hug will send a hug almost immediately to another connected doll or to a selected mobile device. Our favorite feature is the dolls' proximity sensing ability: when two Avakai dolls get close to each other, the belly light begins to pulse and gently vibrate. Kids can use this feature to play a variety of hide and seek-type games, or (since the dolls can be opened up and have a small cavity) they can be used for a treasure hunt at a birthday party or as a rainy day activity. The toy's open source code for programming means that the dolls can be updated with new features, extending the life of the toy. We know there's a lot to learn about these incredible tech dolls so head on over to Avakai's Kickstarter page and prepare to think about dolls in a whole new light.